The OIQ participates in its own way in National Engineering Month, a nationwide initiative to promote the profession to young people and highlight excellence in engineering. Here is an overview of the activities that are scheduled across Québec. “What do I know” about the junior engineer period? It is the perfect time to start applying all the knowledge you have acquired at university while taking advantage of having a full-fledged engineer there to guide you every step of the way, because junior engineers must be supervised by a full-fledged engineer. The junior engineer period lasts 36 months. At the end of the junior engineer period, you will need to master the six competencies (in French) required to practice engineering. To find out more about the junior engineer period, refer to the Guide du Futur Ingénieur (in French) or visit the Junior engineer period page on the OIQ’s Web site. Internships, university studies and sponsorship program can earn you up to a maximum of 24 months of experience credits. Professor Sylvain Martel, Director of the Nanorobotics Laboratory at Polytechnique Montreal, and a team of researchers from Polytechnique Montreal, the Université de Montréal and McGill University have achieved a spectacular breakthrough in cancer research by creating new nanorobotics agents capable of navigating through the bloodstream and administering a drug with precision by targeting the active cancerous cells of tumours, without the usual side effects of chemotherapy. This scientific discovery won top honours in the 24th annual “Discovery of 2016” award competition of Québec Science magazine which celebrates last year’s most impressive discoveries in Quebec. 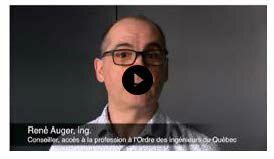 In this video, René Auger, eng., Admission Advisor at OIQ, explains what the junior engineer period is and gives you some tips on how to obtain your engineer permit faster. Have you seen The Godfather? It’s hard to believe, but the sponsorship program does have one thing in common with the cult trilogy by Francis Ford Coppola starring Marlon Brando and Al Pacino: the role of the engineer who sponsors you is sort of like that of a godfather, in that he or she helps you integrate into the profession and obtain your engineer title. Additive manufacturing has just proved once again that it has a bright future ahead of it. In fact, the first 3D-printed concrete pedestrian bridge in the world was created a few weeks ago in Alcobendas, Spain, which is not far from Madrid.